A pilonidal cyst is an abnormal pocket in the skin that generally contains hair and skin debris. A pilonidal cyst is found near the tailbone at the top of the natal cleft of the buttocks. The accurate cause of this problem isn’t known, but its reason is believed to be a grouping of changing hormones (it develops after puberty), hair growth, and friction from clothes or from sitting for a long time. Most pilonidal cysts are caused by loose hairs that break in the skin. Friction and pressure, skin rubbing against skin, bicycling, tight clothing, long periods of sitting or similar factors push the hair down into the skin. The body responds to the hair as a foreign substance and forms a cyst around the hair. Being obese may influence a patient to pilonidal cysts because it increases pressure on the coccyx area. The deeper natal cleft in obese patients supports more moisture and debris buildup. People who sit for long periods of time at home or work have a greater chance of developing pilonidal cysts. The continuous contact between the chair and the buttock cleft puts pressure and increases the probability of getting a pilonidal cyst. Excessive hair growth above the buttocks gives a greater risk of getting pilonidal cysts because it increases the chances of the skin getting irritated. A single factor is not responsible for causing the Pilonidal Sinus or Cyst Problems. Although this problem can be seen among men as compared to women. 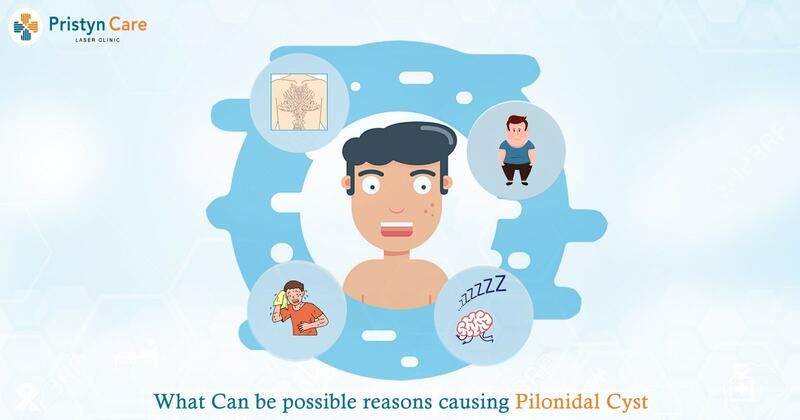 Sitting for long hours is the major cause of Pilonidal sinus. Whatever the factor is, we can get the Laser treatment of Pilonidal Sinus in Gurgaon to get recovered from the problems. By analyzing the actual problem, we can avoid the factor to avoid reoccurrence of the cyst.